It's time to update your phones! I believe it is now rolling out in batches! So expect a notification soon on the update! So it's just a optimizing and performance update? I can't find a full log but it updates the system to Android April Security Patch and has few bugs fixed. One of the bugs fixed is the Google Assistant and Camera Voice Recorder bug where it says microphone is already in use. Good deal. Thanks for the heads up. I received mine too and already downloaded it. Does it solve the screen latency issue? It used to be pretty bad compared to the Samsung S7 and the Nexus 6P. What latency? Can you provide specific example? I would think a dimming type screen at times is my thought but I'm not 100 percent on that. Someone hopefully will confirm that or if I'm wrong in what I'm telling you. The lag between touching the screen and seeing the action on screen (not the lag people usually associate with Android but the response time). There was a very noticeable lag which was the reason I moved on to another cell phone. Was yours isolated or is this common for this device. I ask bc I'm huge on interface and I have not ever noticed any lag time that jumps out at me before. Not even with my first Honor 8. So you mean going from screen to next screen for example if you're on Google online or like opening up apps and if there is lag there? I'll have to keep this in mind as I'm very close to jumping on a Samsung S8 as I've heard touch wiz is much more smooth now compared to the S7 was. Couldn't stand out sticky and choppy it was. 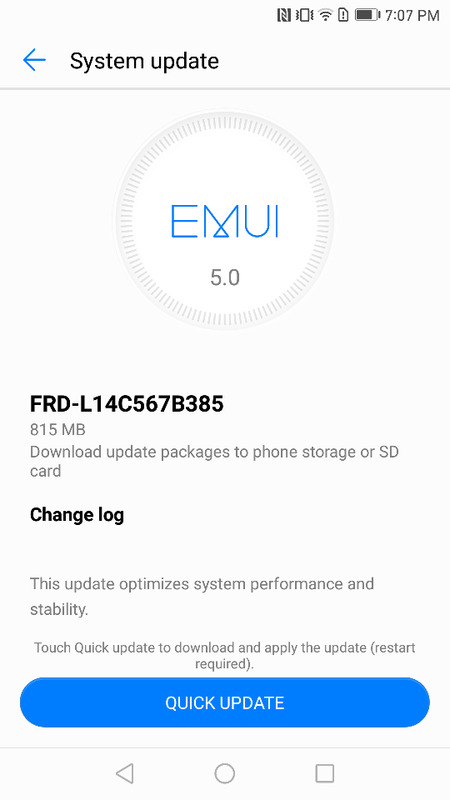 EMUI has been like butter but lag time I've not noticed at all. If you get a chance, let me know what exactly was going on with yours if you don't mind bc I want to replicate what you did to see if I notice it on my honor 8. Thanks! It's a very noticeable lag between when you touch the screen and the response on the screen. It's definitely not an isolated incident as I've noticed it on 3 of my Honor 8s, all different colors (don't ask lol) on Nougat. It's funny you mentioned about the S7 being laggy and the Honor 8 being not, the S7 Edge became kinda my baseline when comparing devices due to its touch responsiveness and other goodies. Occasional lag, yeah I've noticed that with all my Android devices but none of them had touch latency issues as bad as the Honor 8. Devices I've owned and used so far are the Moto X Pure, Nexus 5X, Nexus 6P, Honor 8, Galaxy S7, Galaxy S7E (Exynos) and next week it'll be the Galaxy S8. Edit: One thing to note, I use Google Now launcher on all my Android devices. I've noticed the touch latency mostly on the home screen on the Honor if I remember correctly. Not sure if it's a Google Now thing or an issue with Honor. Don't get me wrong, the Honor is plenty fast but one won't notice the difference unless you've used most of the devices I mentioned above in concurrence. I have not had any latency issues with Honor 8. It could probably be a defective device. Did you contact Honor to see if they could replace if it is under warranty? I've owned both the S7s, Moto Z Force, Z Play, Nexus 6p and a couple others. I've really not noticed this. I'm going to start watching it though. The S7s goodness touch wiz was awful to me. Choppy and sticky and way worse than pure stock Android is too. I came from exclusively apple up until the iPhone 6s so lag time was one thing that choppy and sticky presented to me. So far I've not noticed that with both my honors. I will say I don't use a launcher at all as I love EMUI and the no drawer. Speaking of the S8, please respond back here on what you think of touch wiz on it if you don't mind or private message me about it. I want the regular size S8 but I can't stand touch wiz so I fear it. I'd be curious to know if they have refined it any to be smoother? I've read where honors warranty department lacks on other forums. My last honor had a charging glitch I guess to be considered firmware so I sold it disclosing how you had to get around the default charging issue then bought a Moto Z Play to then realizing I just do not like pure Android so I traded it for a basically brand new other Honor 8 but this time in a 64g. I was going to warranty my original honor but I had to take all these specific pictures and produce my original receipt then I read about their lack of warranty service (not sure if that's accurate or not) and I couldn't go without a device so I was forced to buy which looking back I should have just purchased the Mate 9. Anyways just FYI as that's only what I read so I can't verify that. Did you call Honor support directly? As far as I know, no company takes support tickets from external or even from their internal forums unless you open a ticket directly with them either via a call or using their support website. Yeah I had called and before they would issue me an RA number and label I had to take quite a few pictures of the device then produce a picture of my bill of sale which I didn't have anymore so I just sold it cheap and didn't go through the headache. Hopefully all will be good with my new device for a long while. I also received the update. Played around with it for a while before throwing my sim back in my S8. No problems here. Solid performance. How do you like your S8? As I mentioned in my comment above, this is not an hardware/software issue but a quality issue. I remember reading on xda that the EMUI 5.1 update will definitely improve the latency issue but so far the Honor hasn't received it. I haven't really used TouchWiz/Samsung Experience skin but I have heard its better on Nougat. I used it briefly for a couple of hours and it does look alright. If Samsung could give a way to disable icon notification counter and throw in a vertical scrolling app drawer then I would gladly switch to it. BTW here's how you could test the latency...slide your finger slowly on the screen without lifting it and see how delayed is the scroll response. The Nexus 6P, S7E have a very minor delay, the Honor's was pretty noticeable on the first Nougat update w/ Dec 2016 patch. I love the S8. I've been an LG guy for years but Samsung went software nav so I jumped in. It's my first Samsung device. Actually, I think using the Honor 8 kinda got me ready for the S8 in some ways. I find some of the software similar. Especially the way they both implement certain settings. Switching launcher and wallpaper. That kinda thing. Great device. Amazing display. Best camera I've ever had on a smartphone. I love the S8. I've been an LG guy for years but Samsung went software nav so I jumped in. It's my first Samsung device. Actually, I think using the Honor 8 kinda got me ready for the S8 in some ways. I find some of the software similar. Especially the way they both implement certain settings. Switching launcher and wallpaper. That kinda thing. Great device. Amazing display. Busy camera I've ever had on a smartphone. Dang I've got to grab an S8 now. I want one badly. Honor said there was an update that was being tested that would be out soon when I moaned to them on Twitter a few weeks back. I'm on B380 and check daily and so far nothing has arrived for updates. So annoying they're so poor at updates!! You'll be updated to B385. Updates roll out slowly. And don't expect much deference. The OS is relatively the same. I never got 380, went from 360 to 385. Are you using a US model phone? If you are asking me (OP) - Yes, this is FRD-L14 64GB US Model. This is why I got the s8. Some features honor killed with 5.0 samsung implemented in the s8. That made me super excited. What is it about the HTC U11 that makes you want leave your flagship? How to use backup password to unlock Samsung Tab S2?